Legs are poseable, can extend to total width of 34"
What has eight legs, four eyes, and an attitude? Your new conversation starter, of course! Visitors will shriek with a mix of fear and glee when they see the new member of your household. They thought arachnids were bad before? This bad boy is bigger than a breadbox and is made of nothing but exoskeleton. Hopefully, there aren't more of him back in the nest that he came from. 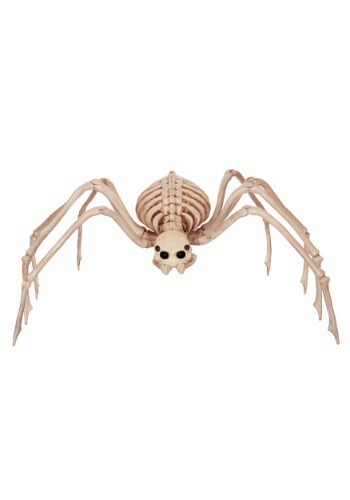 Bring home one of the scariest spiders on the web this Halloween season. You can reposition the legs so the creature's diameter reaches up to 34" and rotate it's head so all four of its eyes can make contact with your nosey neighbor. If you know anyone with arachnophobia you may want to warn them away from your seasonal display, this guy sends shivers up the spine of even the seasoned spider smackers of the house. Set this fellow up this Halloween season, he's sure to make heads spin.